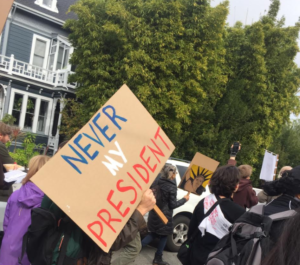 Two months of deliberation and tension culminated on the morning of Inauguration Day when a group of demonstrators descended from UC Santa Cruz to the streets of downtown Santa Cruz. 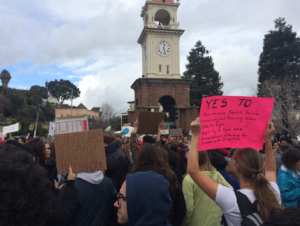 Nearly 500 students, staff and community members marched downtown midday today in protest of Donald Trumps’ presidential inauguration. Photo by City on a Hill Press staff. Students and community members stood against the normalization of the Trump administration and the widespread rhetoric against vulnerable communities like undocumented residents, people of color and LGBTQIA+ identifying persons. 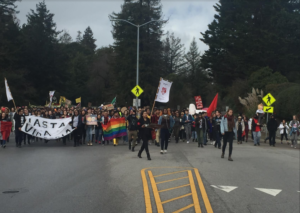 Months before the presidential election, the Santa Cruz General Strike Organizing Committee (SCGSOC) planned this walk-out in conjunction with the nationwide General Strike on Jan 20. The committee, formed by a group of friends in response to the new president’s election, evolved into a network of organizers. The march began with about 50 people at Kresge College and other students and community members joined along the way as the demonstrators marched downtown along Heller Drive and Bay Street, including a group of students of color who were in Quarry Plaza. By the time they converged at the Clock Tower, the demonstrators numbered well over 500. Local artist Carol Harootunian, who protested during the Vietnam War nearly 50 years ago, stressed that mass demonstrations were crucial to enacting social progress. At the Clock Tower on Mission and Front Streets, the demonstrators gathered around a small truck carrying a loudspeaker to listen to community members Ernestina Saldaña and T.J. Demos. After the speeches, the demonstrators marched on a loop through the heart of downtown Santa Cruz along Pacific Avenue, Laurel Street and Front Street. As they convened once again before the Clock Tower, Rage Against the Machine’s “Killing in the Name” played over loudspeakers. Demonstrators then dispersed to attend the various workshops put on by the SCGSOC. The committee facilitated educational and creative workshops, like Post-Snowden Privacy, Banner Making and Why Anti-Capitalism Now. “Opposition to Trump needs to be anti-capitalist because it needs to challenge the economic and political system that enabled him to come to power,” said strike facilitator Michael Gasser at the Why Anti-Capitalism Now workshop, which attracted about 50 people. Though that workshop sent a strong anti-capitalist message, the SCGSOC aimed to remain apolitical and inclusive of all voices. The workshops were meant to be informative and supportive. After, attendees at the assembly and marchers from the protests voiced a desire to keep the resistance against the new federal administration alive. They will continue to meet weekly to discuss further actions. As a reporter, you feel the excitement, the emotion, the energy of the moment, it washes over you. No matter how strongly or not strongly you agree with those catchy signs, you have to keep yourself unbiased, yet alert and involved. That’s what it feels like to report on a protest, you get a front row seat to some of the most raw displays of humanity.